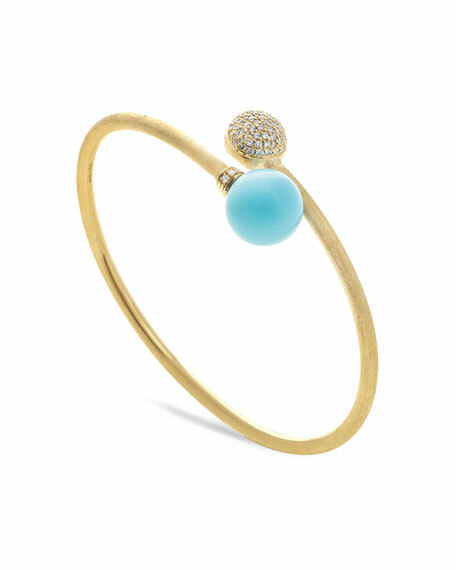 Marco Bicego diamond bangle from the Africa Collection. Signature hand-engraved 18-karat yellow gold band. Thin frame with turquoise and diamond pavé ends. 0.50 total diamond carat weight. Inspired by tribal jewelry and the soft dunes of the Sahara, the Africa Collection is an extravagant expression of golden boules of different sizes and finishes, all individually hand-engraved and textured. Necklaces, bracelets, earrings and rings yield a bold, yet remarkably light and fluid feel.